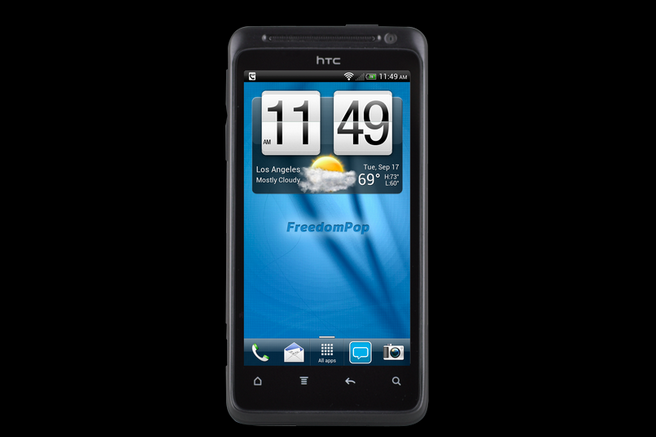 FreedomPop launched one of the country’s first all IP mobile services this month. Consequently, it has to deal with an interesting problem facing all future IP mobile operators: If all your traffic is running over the same data connection, how do you distinguish between voice, SMS and internet traffic so you can charge accordingly? The company is solving that problem by working with Telespree, which provides a cloud-based monetization service for carriers. Basically Telespree is picking apart all of the CDMA and WiMAX (and eventually LTE) data traffic that traverses FreedomPop’s phones. That way it knows not to count a VoIP call or an IP SMS message against a customer bucket of megabytes. Telespree can also track that voice and data traffic – translating kilobytes into minutes and messages consumed – which allows customers to monitor their data, voice and SMS usage. That all seems rather simple, but teasing voice out of the data stream is just a first step. FreedomPop is a ‘freemium’ operator: it’s giving away 500 MB, 200 voice minutes and 500 text messages to its customers for free, but it plans to offer value-added services on top of those core communications apps. And Telespree’s services architecture is tailor-made for that kind of business model. As an all VoIP provider, FreedomPop can layer things like video chat, group messaging and conference calling on top of standard voice and messaging much more easily than any carrier. In a recent conversation, FreedomPop CEO and co-founder Stephen Stokols said that was exactly the direction FreedomPop is heading: offering core communications services for free and charging for premium features layered on top of them. Stokols, however, didn’t reveal any specific details about what those services would be. FreedomPop isn’t just looking at mobile data, minutes and texts as commodities, it sees them as virtual currencies. Customers today can trade megabytes with friends and earn bigger data buckets by referring customers or viewing advertising content. Other companies like Aquto have also latched on to that concept, attempting to turn the megabyte into the mobile equivalent of the frequent flier mile. Over-the-top communications provider Rebtel is letting its international calling customers exchange voice minutes with one another, letting them move value — if not actually cash — across borders. FreedomPop will eventually start letting its customers trade and earn minutes and texts like they can data, Stokols confirmed. But the more interesting idea is how it could combine those freemium and currency models using Telespree’s technology. Here’s one possible example: If you’re calling another FreedomPop customer using your free minutes, perhaps you could get an option to upgrade to a video chat call. You might then get a choice on how to pay for that video session. You could buy video chat minutes or you could deduct double the amount of voice minutes you would consume for a normal voice call. Or you might even get the option to view a video advertisement, which would make the video call free. Eventually, the big operators will be able to offer similar kinds of enhanced communications services when they launch their voice-over-LTE networks. But it’s doubtful they will adopt the same kind of pricing models that carriers like FreedomPop is experimenting with. FreedomPop and competitors like TextNow and Scratch Wireless are mobile virtual network operators (MVNOs) meaning they’re only renting time on another carrier’s network (in all three cases Sprint’s). To them, mobile megabytes and minutes are the expenses of doing business. For the network operators, selling data and voice plans is core to their business strategies. upgrade so-called free memberships to paying ones. Add their almost-deceptive offers of so-called free upgrades (which tell you that only the first month is free, in very fine print on the sign-up page below the SUBMIT button). Finally, their practice of charging accounts an inactivity fee if you didn’t use any data. FreedomPop, before you try getting additional suckers, er customers, you should fix your house and do right by your previous customers who trusted you. How is it suckering, I’m on there, and all of that is clearly spelled out, and no fine print about it. Also any article that you read, recommending freedom pop, points out these “gotchas”. If you got “tricked” so you say, you really didnt read at all, like all consumers should. this is great. i like the fact that they give 200 mins each month. This is very interesting implication alluded to there. Wonder if that is part of the deliberate evolution.